Department of Zoology, University College of Science, Osmania University, Hyderabad - 500007, Telangana, India. ABSTRACT: Fluoride becomes toxic at higher doses which leads to Fluorosis. In addition to dental and skeletal fluorosis, it also affects soft tissues including liver, heart, kidney, muscle, brain, etc. The aim of this study to examine the fluoride-induced oxidative stress and the protective role of Allium sativum ethanolic extract (ASEE) against underlying fluoride induced neurotoxic effects in the brain of rats. Three months old (250-280 wt.) Wistar rats were randomly categorized into 4 groups which were control (received normal tap water), sodium fluoride (NaF) (20 ppm fluoride through IP), NaF (20 ppm) + ASEE (120mg/kg body wt; through oral with plastic gavage), and ASEE. The doses are continued for 15 days, and on completion of treatments behavioral (Rotarod and Hot plate test), oxidative stress markers (LPO, SOD, CAT, GSH-Px) and Histological (Golgi Cox staining) observations were made. NaF treated rats showed significantly (p<0.01) decreased motor coordination, thermal pain response, SOD and Catalase activity. Whereas, LPO levels and GSH-Px activity increased in NaF treated rats. Moreover, they also showed a decreased number of dendrites, synaptic connections and neural networks with compared to control. Oral administration of ASEE to fluoride-treated rats, the aforesaid parameters are significantly reversed concerning NaF treated rats. 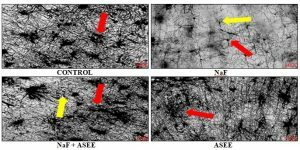 Thus the present study evidenced that ASEE has therapeutic importance to prevent NaF induced behavioral alterations, oxidative damage, and neuro-degeneration in the brain of the rat. INTRODUCTION: Garlic (Allium sativum) belongs to Amaryllidaceae family, and it is used for a long time both in cooking and as a medicinal plant. Garlic is commonly used as an ingredient in many dishes for flavor, aroma, and taste enhancement 1 and it is also a good source of dietary phytochemicals with evidenced properties of antioxidant and ability to modulate the detoxification systems 2. Garlic consists of two principal antioxidant components, flavonoids and sulfur-containing compounds such as di-allyl sulfide, tri-sulfide, and allyl-cysteine 3-4. These antioxidants provide a wide variety of biological properties of garlic, including antitumor 5, hypolipidemic, hypo-cholesterolemic 6, anti-atherosclerotic, antioxidant 7, and immuno-modulatory effects 8. Also, garlic is an effective remedy for several ailments including heart problems, headache, bites, worms and tumors 9. Also, several sulfur-containing compounds other than alliin, such as allicin, 1,2-vinyldithiin, allixin and S- allyl-cysteine 10-11, and sulfides, such as diallyl-, methyl allyl-, and dipropyl mono-, di-, tri- and tetra-sulfides, which are formed after the decomposition of thiosulfinates 12 have potent bioactive properties. The chemical profile of garlic extract and organosulphur molecules present in it including S-allyl cysteine sulfoxide have been reported to exert antioxidant effects through their ability to (1) scavenge reactive oxygen species (ROS) 13, (2) inhibit lipid peroxidation, (3) inhibit oxidative modification of low-density lipoproteins and (4) prevent oxidative damages to DNA 14-15. In earlier reports of Rahman 16 showed that the free radical scavenging activity of garlic oil and it also modulate the levels of lipid peroxidation by stimulating glutathione-peroxidase activity. Also, it was also reported that the garlic extract prevents the formation of superoxide anion and hydrogen peroxide and thus protect from free radical-induced damage 17. Based on these observations, the present study is aimed to evaluate the protective effects of ASEE on sodium fluoride-induced neurodegene-rative effects and oxidative damage in Wistar rats. In CNS, fluoride vitally affects the brain, and within the brain, it particularly affects the hippocampus region where learning and memory process takes place 21. The basic mechanism involved in fluoride toxicity is the enhanced production of free radicals and which in turn oxidizes membrane lipids and thus alter the myelin sheath, and consequently degeneration of neural cells resulted. Under the normal healthy conditions, the brain is protected from free radical damage by a balanced status between pro-oxidant and antioxidants mechanisms, which include antioxidant enzymes and free-radical scavenging chemicals 21. In earlier reports, many researchers used the natural compound to treat F toxicity which includes; tamarind fruit pulp 22-23, Amla 24, black tea 25, curcumin 26-27, quercetin 28-29, Abelmoschus moschatus seed extract 30, vitamin E 31, resveratrol 32-33, vitamin C 34, vitamin A 35 and calcium 36. These natural products are a rich source for antioxidants which reduce F toxicity using reduction of free radical generation and decreased lipid peroxidation (LPO). Given this, it is proposed that the ethanolic extract of Allium may prevent and reduce the production of free radicals from fluoride and thus it could be Protectant for fluoride induced neurotoxicity. Hence, this study reports the protective effects of Allium ethanolic extract against NaF induced behavior, oxidative stress, and neurohistological alterations. Garlic Extraction: The extract of garlic was carried out by a slightly modified method of Eidi et al. 37 The garlic cloves (500 g) were purchased from local markets of Hyderabad, India, identified and authenticated (no. 359) in the Department of Botany, Osmania University, Hyderabad, India, and specimen was kept in the Department for future reference. They were peeled, washed with distilled water for twice and shade dried till the water drops are evaporated. Dried cloves of garlic were ground, and it was soaked in 95% ethanol (1 Litre) for one week and filtered it through filter paper. Rotavapor evaporated the filtrate. The obtained extract of Garlic was stored at -20 ºC until being used. Animals: Male Wistar rats around 250-300 g were purchased from NIN, Hyderabad and they were housed under laboratory conditions like temperature 22-24 ºC, relative humidity was 40-60%, and light and dark cycles were maintained at 12 h interval (6.00 am to 6.00 pm). They were housed in polythene cages and allowed for one week for acclimatization. After that, they were checked for a health condition and all healthy animals were randomly segregated into four groups. Throughout the experimental duration, the rats were fed on a standard rat pellet diet and tap water ad libitum. IAEC, Department of Zoology permission was taken to conduct experiments on rats (CPCSEA No: 383/01/a/CPCSEA). Group 1: Control rats (fed on tap water). Group 2: Sodium fluoride (NaF) treated rats (20 ppm of NaF was given through IP). Group 3: NaF (20 ppm; through IP) + Allium sativum ethanolic extract (ASEE; 120 mgkg-1 body wt; through intra-gastrically with plastic gavage). Group 4: Allium sativum ethanolic extract (ASEE; 120 mgkg-1 body wt.). The garlic extract was dissolved in 0.5 ml of distilled water and administered for each animal, and the doses were continued for 15 days. After completion of experimental duration the rats were used for behavioral tests, and after that, they were sacrificed, dissected out the brain and used to assess various oxidative stress markers and histological examinations. Chemicals: Thiobarbituric acid (TBA), Pyrogallol, Diethylene triamine penta acetic acid (DETPA), EDTA, H2O2, Potassium dichromate, and others were purchased from local chemical suppliers. Rota-Rod Test: The rotarod test is a behavioral test which is commonly used for small laboratory animals particularly rodents. Rats try to balance themselves on a rotating rod, and it is widely used to assess motor coordination. The retention time on the rod, falling frequency of the rod and falling speed are considered to assess the motor performance. In this study, the instrument (DolphinTM instruments) had incremental fixed-speed (about 30 rpm) rotating rod. The animals were kept on the rotating rod and time of their first falling off, and the frequency of falling off the rod are recorded for each rat and noted the recordings in minutes 38. Hot Plate Test: The Eddy’s hot plate test is widely used for evaluating thermal pain response. The rat foot pads are contacted with hot plate surface which is maintained at 55 ± 0.5 ºC. The rat was introduced into hot plate during the experiment, and it was observed for the occurrence of heat-induced nociceptive pain responses like licking of a hind paw or fore paw, face washing, jumping, etc. The latency time to exhibiting these behaviors is taken as response time, and it was noted in seconds 39. Lipid Peroxidation (LPO): Oxidation of lipid membranes of brain tissue was assessed by the method of Bhuyan et al. 40 The end product of the lipid peroxidation is malondialdehyde (MDA) which reacts with TBA to produce a pink adduct, which is measured at 533 nm on spectrophotometer and its levels were expressed as µmol of MDA/g weight of tissue. Superoxide Dismutase (SOD): The SOD activity in the brain tissue was assessed by the method of Murkland and Murkland 41. The pyrogallol autoxidation was studied in the presence of EDTA and absorbance was recorded at 420 nm on a spectrophotometer. The enzyme, SOD activity was presented as Units/min/100 mg of tissue. Catalase: Catalase activity was assessed by measuring the rate of decomposition of H2O2. H2O2 is degraded in the presence of enzyme into H2O and O2, and it is the basis for assay. This was measured on a spectrophotometer at 260 nm. One unit decomposes one micromole of H2O2 per minute/100 mg tissue 42. Glutathione Peroxidase (GSH-Px): According to the Rotruck et al., 43 GSH-Px activity was measured. GSH-Px reduces Cumene hydroperoxide while oxidizing GSH to GSSG. The GSSG thus generated is reduced to GSH in the presence of glutathione reductase with consumption of NADPH. The decrease of NADPH is directly proportional to GSH-Px activity, and it was measured on a spectrophotometer at 340 nm. The activity of GSH-Px was expressed as units/gm protein. Golgi Cox Stain: Golgi Cox staining method was followed by Gibb and Kolb 44, and this stain generally used to study neural connections, circuitry, and neuronal networks. The staining solution was prepared by mixing of equal volumes of 5% potassium chromate, 5% potassium dichromate, 5% mercuric chloride and an equal volume of distilled water. Brains were dissected out and preserved in this solution for 10 days in the dark room. After that, they were transferred to 30% sucrose solution and kept for 6 - 8 h at 4 ºC. Then the brain was fixed on vibratome stage with cyanoacrylate glue and made into sections about 10µ thick. These sections were transferred to water, hypo, water, and ammonium solution and to graded alcohol baths (30%, 50%, 70%, 90%, and 100%). The slides were prepared and observed under a digital microscope with 4X. Statistical Analysis: Data is exposed to analyses of variance (ANOVA) to assess the effect of Na-F and t-test was conducted in all possible combinations of experimental groups for individual comparison. Data presented as mean ± SEM and probability of p<0.01 and p<0.001 was considered significant for all evaluations. Rota-Rod Test: The decreased motor coordination was observed in NaF intoxicated rats with compared to control and recovered in NaF + ASEE compared to NaF treated rats. The percentage of decreased motor coordination is about 29.16% in NaF, 17.67% in NaF + ASEE and -2.50% in ASEE when compared to a control group of rats Fig. 1. Hot Plate Test: The NaF treated rats showed increased latency time in Eddy’s hotplate, i.e. the reduced pain response to heat-induced stimulus with compared to control rats. It was reverted on the administration of ASEE towards NaF toxicity. The percent of change from control rats was about -38.09% in NaF, -15.07% in NaF + ASEE, and -4.76% in ASEE treated rats Fig. 2. Lipid Peroxidation: Oxidation of membrane lipids was increased in NaF treated rats concerning control rats, and its levels were reversed in NaF + ASEE treated rats. There is no significant alterations were observed in the levels of lipid peroxidation in ASEE received rats. The percent of change in LPO levels in NaF received rats from control is by -38.46%, in NaF + ASEE, treated rats is by -15.38% and in ASEE administered rats is by 7.69% Fig. 3. Superoxide Dismutase: The decreased superoxide dismutase activity was observed in NaF exposed rats with compared to control rats. Its activity was reverted on the administration of ASEE towards fluoride toxicity, and ASEE received rats displayed the normal SOD activity which is comparable with control rats. The SOD activity was decreased about 18.75% in NaF, 12.50% in NaF + ASEE and 3.12% in ASEE treated rats when compared to control group of rats Fig. 4. Catalase: The decreased catalase activity was observed in NaF intoxicated rats when compared to control rats, and it was decreased about 22.22%. In NaF + ASEE treated rats, the catalase activity was reverted, and the percent of change from control is by 11.11%. ASEE received rats showed the normal catalase activity, and there is no significant difference between control and ASEE treated rats Fig. 5. Glutathione Peroxidase: The increased (-9.52%) GSH-Px activity was recorded in NaF received rats when compared to control rats. It was reversed on treatment with ASEE towards NaF toxicity. ASEE received rats showed the normal GSH-Px activity Fig. 6. Golgi Cox Stain: The decreased number of dendrites, terminal branches, synaptic connections, axon collaterals and neural networks in NaF received rats when compared to control group of rats. These all alterations were reverted on adminis-tration of ASEE towards NaF toxicity Fig. 7. DISCUSSION: The emphasis of this study is on anti-oxidants’ alterations, neurohistological changes and their consequences in behavioral alterations in rats exposed to NaF and as well as the protective role of Allium sativum extract. The experimental data showed oxidative damage, changes in neuronal networks, biochemical metabolisms and behavioral alterations in rats which treated with sodium fluoride whereas the oral administration of ASEE reverted those alterations. NaF fed rats showed decreased motor performance concerning control group of rats. It was measured regarding latency time, grip strength, times of falling from the rod. NaF + ASEE treated rats exhibited improved performance compared to NaF group. ASEE received rats showed the normal forelimb to hind limb coordination, and results were comparable to control rats. In our earlier report, the decreased motor coordination was recorded in NaF received rats and it was reverted on treatment with okra seed extract 30. Moreover, the decreased endurance time in NaF treated rats on rotarod test was reported by Ekambaram and Paul 45 and Bera et al. 46 The rats received garlic treatment against NaF showed the increased endurance time on rotating rod, and these results were in agreement with Mathew and Biju 47. Decreased pain response to the thermal stimulus was recorded in NaF received rats with compared to control rats. These results were similar to Madhavan et al., 48 and Sudhakar et al., 30 studies in which they reported the decreased pain response particularly to heat stimulus. NAF+ASEE treated rats showed the increased pain response to a heat stimulus. NaF produces an excess amount of free radicals which damage the skin surface receptors and their membrane composition, initiate the process of apoptosis. Due to the decreased number of receptors and decreased sensitivity to stimulus, the pain response was decreased in NaF treated rats. Garlic is reported with the presence of two principal antioxidant component classes, flavonoids and sulfur-containing compounds such as diallyl sulfide, tri-sulfide, and allyl-cysteine 3-4. The chemical profile of garlic helps in the elimination of free radicals which were generated from fluoride. Thus prevent the apoptosis of receptors present on the skin surface and as a result, increase the pain response. The free radicals mediate their noxious effects on soft tissues. Oxidative stress may be a key feature in neurodegenerative diseases 49. Fluoride has been shown marked increased in MDA that indicates lipid peroxidation caused by multiplied free radicals 50. Sudhakar et al., 30 studies showed the increased LPO levels in NaF received rats. Moreover, it was also reported the increased LPO levels in erythrocytes, liver, kidney tissues of rabbits exposed to fluoride 51. The present results are in agreement with earlier studies with increased LPO levels in NaF received rats. NaF + ASEE treated rats showed the reversed levels of LPO. Furthermore, NaF received rats showed decreased SOD and increased GSH-Px activity in their brain tissues. The decreased SOD, CAT activity and GSH content were found in NaF exposed rats 30. Fluoride is known to inhibit antioxidant enzymes like SOD and catalase activity 52. Garlic extract treated rats showed the increased SOD activity and decreased the activity of GSH-Px. Garlic protects against oxidative damage 17. The antioxidant chemicals present in garlic extract prevent diseases which caused by oxidative damage 53. Histological observations showed the decreased number of dendrites, terminal branches, axon collaterals, synaptic connections and neural networks in NaF treated rats with compared to control rats. Earlier studies reported that the histological alterations in the hippocampus and cerebral cortex regions and decreased neuronal networks of brains of rats and rabbits intoxicated with sodium fluoride 54-56. 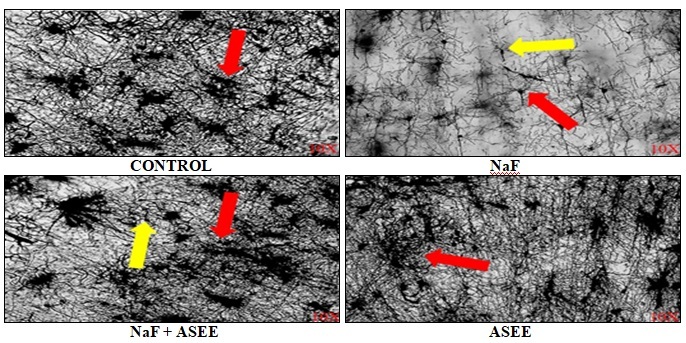 NaF intoxicated rats showed alterations in size and shape of the cell and amyloid plaque formation 30, 57, decreased the amount of Nissl substance, number of dendritic branches, neural connections and networks 57. The free radicals generated from fluoride oxidizes membrane lipids and thus initiate and increase the apoptotic mechanism and as a consequence decreased neural connections result in NaF exposed rats. Due to oxidation of myelin lipids, myelin sheath was destructed, and thus neuronal loss resulted and finally brain architecture was disturbed. NaF + ASEE treatment reverted the alterations above. Sudhakar et al., 57 studies also reported the reversal of earlier mentioned alteration on treatment with okra seed extract. Garlic is a rich source for anti-oxidants particularly, flavonoids, diallyl sulfide, trisulfide, allyl-cysteine, allicin, 1,2-vinyldithiin, allixin, and S- allyl-cysteine which reduce the production of free radicals from fluoride and also eliminate excess free radicals thus negate the oxidative stress, keep balanced status of oxidant-antioxidant status of the brain. Thus, ASEE maintains normal LPO levels, healthy neural networks and thus nullify fluoride toxicity. In summary, fluoride produces a high amount of free radicals which interact with membrane lipids and increase their oxidization. Due to increased oxidation LPO levels and catalase activity was increased while decreased SOD and GSH-Px activity were observed and thus overall biochemical milieu was disturbed on NaF exposure. Increased oxidation mechanisms initiate the myelin destruction, neural cell death, synaptic connections and neural networks in the brain. Central systems (CNS) are crucial for maintaining and controlling behavioral responses. Thus fluoride generated free radicals ultimately resulted in decreased behavioral responses. Garlic possesses antioxidants like flavonoids and sulfur compounds (diallyl sulfide, trisulfide, allyl-cysteine) which eliminate and balance the free radicals and thus revert all alterations. CONCLUSION: In conclusion, free radicals produced from fluoride disturb the biochemical status and morphology which results in altered behavioral responses. The garlic extract possesses good antioxidants like flavonoids and sulfur-containing compounds which help in reduce the production of free radicals from NaF, thus provide beneficial effects against NaF neurotoxicity. Hence, the present study concludes that the possible reason for reduced fluoride neurotoxicity is by removal of free radicals with a parallel treatment of ASEE. ACKNOWLEDGEMENT: Authors express gratitude to UGC-DSA-II for financial support. Stajner D and Varga IS: An evaluation of the antioxidant abilities of Allium species. Acta Biologica Szegdiensis 2003; 47(1-4): 103-106. El-Demerdash FM, Yousef MI, and Abou EI-Naga NI: Biochemical study on the hypoglycemic effects of onion and garlic in alloxan-induced diabetic rats. Food Chem Toxicol 2005; 43: 57-63. Bozin B, Mimica-Dukic N, Samojlik I, Goran A and Igic, R: Phenolics as antioxidants in garlic (Allium sativum, Alliaceae). Food Chem 2008; 111: 925-929. Kodera Y, Suzuki A, Imada S, Kasuga S, Sumioka I and Kanezava A: Physical, chemical and biological properties of S-acetylcysteine, an amino acid derived from garlic. J Agric Food Chem 2002; 50(3): 622-632. Ejaz S, Woong LC, and Ejaz A: Extract of garlic (Allium sativum) in cancer chemoprevention. Exp Oncol 2003; 25: 93-97. Elmahdi B, Maha MK, and Afaf IA: The effect of freshly crushed garlic bulbs (Allium sativum) on plasma lipids in hypercholesterolemic rats. Res J Anim Vet Sci 2008; 3: 15-19. Omurtag GZ, Güranlıoğlu FD, Şehirli Ö, Arbak S, Uslu B and Gedik N: Protective effect of aqueous garlic extract against naphthalene induced oxidative stress in mice. J Pharm Pharmacol 2005; 57: 623-630. Bruck R, Aeed H, Brazovsky E, Noor T, and Hershkoviz R: Allicin, the active component of garlic, prevents immune-mediated, concanavalin A-induced hepatic injury in mice. Liver Int 2005; 25(3): 613-621. Thomson M and Ali M: Garlic [Allium sativum]: A review of its potential use as an anti-cancer agent. Current Cancer Drug Targets 2003; 3: 67-81. Jabbes N, Arnault I, Auger J, Dridi BAM and Hannachi C: Agro-morphological markers and organo-sulfur compounds to assess diversity in Tunisian garlic landraces. Scientia Horticulturae 2012; 148: 47-54. Kopec A, Piatkowska E, Leszczynska T and Elizbieta S: Healthy properties of garlic. Current Nutrition and Food Science 2013; 9: 59-64. Lanzotti V, Scala F and Bonanomi G: Compounds from Allium species with cytotoxic and antimicrobial activity. Phytochemistry Reviews 2014; 13: 769-791. Carmia B: Antioxidant health effects of aged garlic extract. J Nutr 2001; 131: 1010S-1015S. Kim KM, Chun SB, Koo MS, Choi WJ, Kim TW, Kwon YG, Chung HT, Billiar TR and Kim YM: Differential regulation of NO availability from macrophages and endothelial cells by the garlic component S-allyl cysteine. Free Radic Biol Med 2001; 30: 747-756. Shaarawy SM, Tohamy AA, Elgendy SM, Abd-Elmageed ZY, Bahnasy A, Mohamed MS, Kandil E and Matrougui K: Protective effects of garlic and silymarin on NDEA-induced rats Hepatotoxicity. Int J Biol Sci 2009; 5: 549- 557. Rahman K: Garlic and aging: new insights into an old remedy. Ageing Res Rev 2003; 2: 39-56. Borek C: Antioxidant health effects of aged garlic extract. J Nutr 2001; 131: 1010-1015. Mirona PK, Elżbieta K, Danuta KB, Natalia LA, Halina B, Sebastian S, Irena BB, Izabela G and Dariusz C: Fluoride in the compact bone after femoral head arthroplasty in patients from North-Western Poland. Fluoride 2015; 48(2): 93-104. Inkielewicz I and Krechniak J: Fluoride content in soft tissues and urine of rats exposed to sodium fluoride in drinking water. Fluoride 2003; 36: 263-266. Adebayo OL, Shallie PD, Salau BA, Ajani EO and Adenuga GA: Comparative study on the influence of fluoride on lipid peroxidation and antioxidants levels in the different brain regions of well-fed and protein undernourished rats. J Trace Elem Med and Biol 2013; 27: 370-374. Khandare AL, Kumar PU and Lakshmaiah N: Beneficial effect of tamarind ingestion on fluoride toxicity in dogs. Fluoride 2000; 33(1): 33-38. Reddy MM and Reddy KP. Protective effects of aqueous extract of fruit pulp of Tamarindus indica on motor activity and metabolism of the gastrocnemius muscle of rats treated with fluoride. Int J Toxicol Pharmacol Res 2015; 7(5): 241-248. Vasant RA and Narasimhacharya AV: Alleviatory effects of Emblica officinalis as a food supplement in fluoride-induced hyperlipemia and oxidative stress. 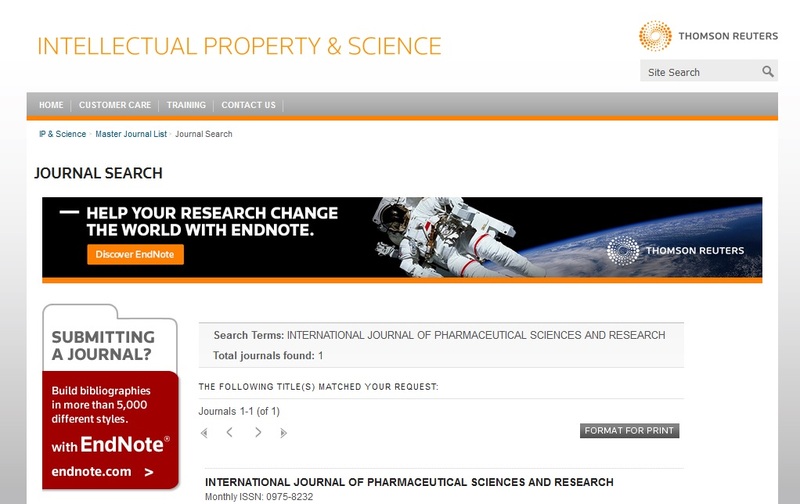 Int J Pharm Pharm Sci 2012; 4(1): 404-408. Kamel MM, El-Lethey H, Shaheed I and Kamel G: Black tea forestalls sodium fluoride-induced neurobehavioral toxicity in laboratory rats. J Am Sci 2010; 6(12): 1655-1673. Nabavi SF, Moghaddam AH, Eslami S and Nabavi SM: Protective effects of curcumin against sodium fluoride-induced toxicity in rat kidneys. Biol Trace Elem Res 2012; 145(3): 369-374. Nageshwar M, Sudhakar K, Reddy NCS and Reddy KP: Neuroprotective effects of curcumin on sodium fluoride-induced behavioral and enzymatic changes in brain and muscles of the rat. J Environ Biol 2017; 38: 675-681. Nabavi SF, Nabavi SM, Mirzaei M and Moghaddam AH: Protective effect of quercetin against sodium fluoride-induced oxidative stress in rat’s heart. Food Funct 2012; 3(4): 437-441. Mesram N, Nagapuri K, Banala RR, Nalagoni CR and Karnati PR: Quercetin treatment against NaF induced oxidative stress-related neuronal and learning changes in developing rats. J King Saud Univ Sci 2017; 29: 221-229. Sudhakar K, Nageshwar M and Reddy PK: Seed extract of Abelmoschus moschatus medik reverses NaF-induced behavioral changes through neurodegeneration and oxidative stress in brain of the rat. Asian J Pharm Clin Res 2017; 10(10): 165-171. Al-Hayani A, Elshal EB, Aal IH and Al-Shammer E: Does vitamin E protect against sodium fluoride toxicity on the cerebellar cortex of albino rats. 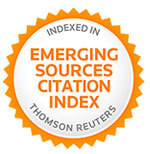 Middle East J Sci Res 2013; 16(7): 1019-1026. Pal S and Sarkar C: Protective effect of resveratrol on fluoride-induced alteration in protein and nucleic acid metabolism, DNA damage and biogenic amines in rat brain. Environ Toxicol Pharmacol 2014; 38(2): 684-699. Reddy CH and Reddy PK: Protective effects of resveratrol against neuronal damage through oxidative stress in cerebral hemisphere of aluminum and fluoride-treated Interdisci Toxicol 2016; 9(2): 101-105. Yilmaza BO and Erkan M: Effects of vitamin C on sodium fluoride-induced oxidative damage in sertoli Fluoride 2015; 48(3): 241-251. Banala RR and Karnati PR: Vitamin A deficiency: An oxidative stress marker in sodium fluoride (NaF) induced oxidative damage in developing rat brain. Int J Development Neurosci 2015; 47: 298-303. Mohamed NE: The Role of Calcium in Ameliorating the Oxidative Stress of Fluoride in Rats. Biol Trace Elem Res 2016; 170(1): 128-144. Eidi A, Eidi M and Esmaeili E: Antidiabetic effect of garlic (Allium sativum) in normal and streptozotocin-induced diabetic rats. Phytomedicine 2006; 13: 624-629. Saunders H, Jessica AL, Howard E, Gendelman and Lee MR: Murine motor and behavior functional evaluations for acute 1-methyl-4-phenyl-1, 2, 3, 6-tetrahydropyridine (MPTP) intoxication. J Neuroimmune Pharmacol 2012; 7(1): 279-288. Gunn A, Bobeck EN, Weber C and Morgan MM: The Influence of Non-Nociceptive Factors on Hot Plate Latency in Rats. J Pain 2011; 12(2): 222-227. Bhuyan KC, Bhuyan DK and Johansen N: Estimation of Malondialdehyde. IRCS Med Sci 1981; 9: 126-127. Murkland S and Murkland G: Involvement of the superoxide anion radical in the autoxidation of pyrogallol and a convenient assay for superoxide dismutase. Eur J Biochem 1974; 47: 469-474. Brannan TS, Maker HO and Raess IP: Regional distribution of catalase in adult rat brain. J Neurochem 1981; 86: 307-309. Rotruck JT, Pope AL, Ganther HE, Swanson AB, Hafeman DG and Hoekstra WG: Selenium: biochemical role as a component of glutathione peroxidase. Science 1973; 179: 588-590. Gibb R and Kolb B: A method for vibratome sectioning of Golgi - cox stained whole rat brain. J Neurosci Methods 1998; 79(1): 1-4. Ekambaram P and Paul V: Calcium is preventing locomotor behavioral and dental toxicities of fluoride by decreasing serum fluoride level in rats. Environ Toxicol Pharmacol 2001; 9: 141-146. Bera I, Sabatini R, Auteri P, Flace P, Sisto G and Montagnani M: Neurofunctional effects of developmental sodium fluoride exposure in rats. Eur Rev Med Pharmacol Sci 2007; 11: 211-224. Mathew B and Biju R: Neuroprotective effects of Garlic A Review. The Libyan J Med 2008; 3(1): 23-33. Madhavan S, Nayak M, Shenoy A, Shetty R and Prasad K: Dentinal hypersensitivity: A comparative clinical evaluation of CPP-ACP F, sodium fluoride, propolis, and placebo. J Conserv Dentist (JCD) 2012; 15(4): 315-318. Yan MH, Wang X and Zhu X: Mitochondrial defects and oxidative stress in Alzheimer disease and Parkinson disease. Free Radic Biol Med 2013; 62: 90-101. Inkielewicz-Stepniak I and Czarnowski W: Oxidative stress parameters in rats exposed to fluoride and caffeine. Food Chem Toxicol 2010; 48(6): 1607-1611. Ranjan R, Swarup D and Patra RC: Oxidative stress indices in erythrocytes, liver, and kidneys of fluoride-exposed rabbits. Fluoride 2009; 42(2): 88-93. Zhang M, Wang A, He W, He P, Xu B and Xia T: Effects of fluoride on the expression of NCAM, oxidative stress, and apoptosis in primary cultured hippocampal neurons. Toxicol 2007; 236(3): 208-216. Amagase H: Antioxidant and radical scavenging effects of aged garlic extract and its constituents. In: Antioxidants and Disease, 6th Congress on Clinical Nutrition. Banff, Alberta, Canada 1997; 28. Bhatnagar M, Pratima R and Susma J: Neurotoxicity of fluoride: Neurodegeneration in the hippocampus of female mice. Indian J Exp Biol 2002; 40: 546-554. Shashi A: Histopathological investigation of fluoride-induced neurotoxicity in rabbits. Fluoride 2003; 36: 95-105. Shivarajashankara YM, Shivarajashankara AR, Bhat PG, Rao SM and Rao SH: Histological changes in the brain of young fluoride-intoxicated rats. Fluoride 2002; 35(1): 12-21. Sudhakar K, Nageshwar M and Reddy PK: Abelmoschus moschatus extract reverses altered pain and neurohistology of a rat with developmental exposure of fluoride. J App Pharm Sci 2018; 8(06): 094-104. Manusha S, Sudhakar K and Reddy KP: Protective effects of Allium sativum extract against sodium fluoride induced neurotoxicity. Int J Pharm Sci & Res 2019; 10(2): 625-33. doi: 10.13040/IJPSR.0975-8232.10(2).625-33.